Mar. 21, 2014 1:00 p.m.
Two Knights fight for honor at KnightHaven’s Medieval Fair. To view the video type this url into your internet browser or sacan the qr code with your smart phone. Chivalry and swordplay The ‘Parade of Programs’ held in the Wetaskiwin Drill Hall was the scene of a battle-to-the-end. Weapons were handed out to four young and in-experienced warriors who looked across the hall at their opponents who appeared to be four experienced and much better equipped medieval warriors. The two groups began the battle and as swords and other medieval weapons struck the warriors, bodies littered the floor. KnightHaven hosts events that replicate chivalry, swordplay, honor and combat that was conducted during the medieval period. The games and mock battles are available for the enjoyment of both participants and spectators. Knight Haven’s battle group uses foam and latex weapons and real armor for hand to hand combat, as well as longbow and crossbow for archery to re-create the feel of the medieval battlefield. Over time, the fellowship was called upon to demonstrate medieval costume, language, swordplay and way of life, at public events, schools and corporate gatherings. The demonstrations and classes are fun, informative, and entertaining. 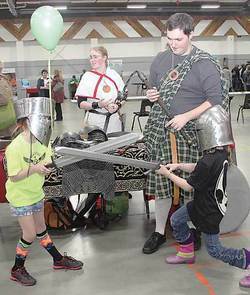 Members are engaged in a fun, adventurous role-playing games and mock battles that are played out in a public arena for participants and onlookers to enjoy. KnightHaven is a bold, exciting new company that offers these demonstrations, and is continually developing new ways to further promote the medieval way of life as a fun way to experience and learn our history. A medieval Day Camp will be held in Wetaskiwin, July 21st, 2014 to July 25th, 2014. Round up all the would-be Knights, Vikings and Highlanders and get ready for a week filled with archery, swordplay, drama, music, crafts and medieval games. For more information go to www.knighthaven.org.